Caption slip reads: "Photographer: Olmo. Date: 1958-06-03. Reporter: Donoghue. Assignment: Cuban gunsmiths. Special Instructions: Daily. 17/18/19: Attorney Alan Meyerson with Eddie Martinez, wanted in connection with guns for Castro case, as they [sic] lawyer surrendered Martinez at the U.S. Treasury Agents office in the Hill street subway terminal building. 19: Guillermo Colls and Israel Cecilio Tapanes, two of the Cubans arrested in connection with Lynwood arms cache, at Treasury Agents office in Subway Terminal Building. 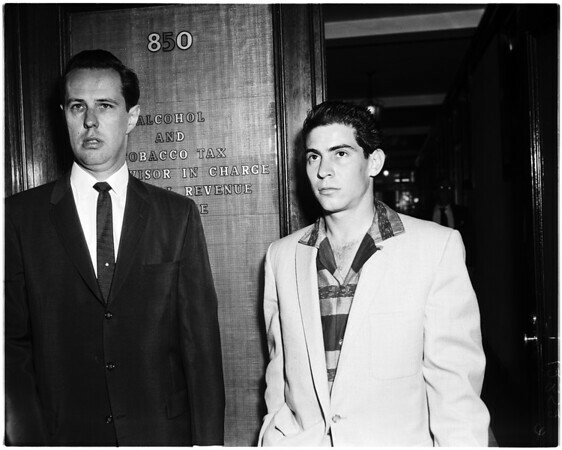 Pair accompanied Eddie Martinez as he surrendered to act as interpreters. They are free on bail".